Every room needs some sort of lighting; it’s one of those necessities you just take for granted, and since most of us can’t afford grand chandeliers, lighting is generally considered to be one of the more basic, run-of-the-mill parts of a room. This is a total missed opportunity, though; instead of settling, why not turn your lighting into a décor statement of its own? Our Hubbardton Forge Wall Sconces are the perfect way to turn your light fixtures into accent pieces so you can achieve both the look and the lighting of your dreams in every room of the house. Some light fixtures not only brighten up the home in the most modern and elegant of ways, but their designs can also take us on a mental trip back into our history. Sconces are the kind of modern lighting sources that remind the home decorator of tradition. Before electricity, people used sconces as place holders for the candles, or as gas torches that they carried with them. Hubbardton Forge sconces are light fixtures that are attached to the wall, serving both as a wall decoration and a source of light. The word sconce now brings a sense of something historical, or antique, no matter how modern your choice of light fixtures. Table lamps are a decorating necessity that have been overlooked far too often. While emphasis has been given to accessories and ceiling lighting, the necessary touch of a table lamp has been forgotten. These days, new and modern looks emphasize minimalism and simplicity. The old-fashioned idea of a fabric shaded table lamp often isn’t a pleasant one. What most do not realize, however, is that Hubbardton Forge table lamps are some of the most artistic and modern looking table lamps available on today’s market. Hubbardton Forge manufactures the highest quality of chandeliers, floor lamps, wall sconces and table lamps. If you`re looking for lighting fixtures that combine beauty with elegance, Hubbardton Forge table lamps are the ones for you. Table lamps are a great way to light up a room. Whether you`re looking for something in your living room or a bedside table lamp to read by at night, Hubbardton Forge`s wrought iron table lamps will make a beautiful statement in your home. Many of the Hubbardton Forge table lamps feature unique and beautiful designs, such as swirling, wrought iron leaves and scrolls. If you`re looking for something a bit simpler, Hubbardton Forge also offers very sleek and straightforward table lamps. Hubbardton Forge is well-versed in the creation of chandeliers that will last the test of time. Using high-quality materials, like hand-forged wrought iron, in their designs, these are not just simple light fixtures – they are true works of art. These naturally beautiful pieces incorporate simple glass and candles with iron to create a rustic, yet sophisticated final product. 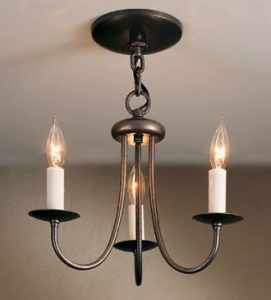 If you are looking for something that will add a touch of elegance to your home, look no further than our selection of Hubbardton Forge chandeliers at Crescent Harbor. The most important parts of your home are the areas where people gather together. At the dining room table, the kitchen island, around a family room coffee table: whether you’re gathered with friends, family, or neighbors, these tend to be the parts of the home where people congregate, making them some of the most loved and cherished places. And special spots like these deserve to be highlighted. After all, these are the places where the most photos are taken and memories made. So why not shine a little light on them with a Hubbardton Forge pendant light that is as unique and beautiful as the gatherings at your home? 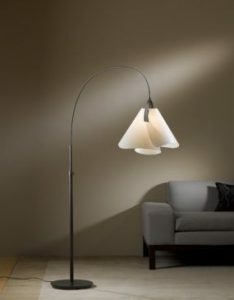 Hubbardton Forge floor lamps are one of the most unique products you can use to decorate your home. Their sturdy whimsy adds a unique charm to every room, and they will last you a lifetime. In today’s world of mass-production, it is too easy to buy something, use it for a few years, and then throw it away. This “use it, then lose it” approach to material objects is not just wasteful; it’s emotionally hollow, too. Hubbardton Forge floor lamps are handcrafted and designed to create a feeling that will last many years. Made by a venerable company—one of the oldest in Vermont—these lamps are meant to last a lifetime, and could even be passed down to the next generation. Are you looking for something to liven up a dull room in your home? Hubbardton Forge floor lamps may be just what you’ve been searching for. These beautiful floor lamps are made from the highest-quality materials and are certainly not lacking in style. 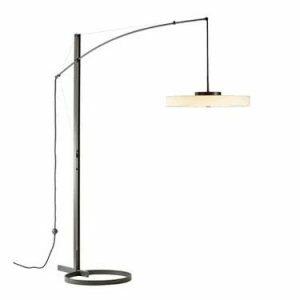 Whether you are looking for something simplistic and elegant, or whimsical and unique, Hubbardton Forge has a floor lamp that will match your own personal design style. Crescent Harbor prides itself on carrying top-of-the-line, hand-forged, wrought iron Hubbardton Forge table lamps that will make a bold and brilliant statement to anyone’s home décor. Many of these gorgeous lamps feature intricate unique design elements that are simple and elegant. Having the right light fixtures in your home can make all the difference to the look and feel of your home. Homes that are improperly lit or feature dull and generic lighting fixtures can feel cold and unwelcoming. Indeed, lighting is one of the most important elements of a home’s décor. Don’t settle for generic store-brand table and floor lamps. Why would you when you can have something as beautiful as a Hubbardton Forge Table Lamp? These light fixtures are stunning and one-of-a-kind, and will continue to light up your room – and your life – for many years.